We continue as the bell tolls for 2014 Hall of Fame Inductee, Jake “The Snake” Roberts at Wrestlemania VIII. I had previously shown my distaste for the Snuka match a year before, but accepted it as putting The Undertaker over and giving The Streak life. It is amazing what difference a year makes because The Undertaker was on the turn of becoming face in his battle against The Snake. Roberts had gotten massively over as a heel for his torment of the late great Macho Man Randy Savage and Elizabeth. In his attempt to torment the pair further with a steel chair, The Undertaker made the unexpected save to begin the build to Wrestlemania. 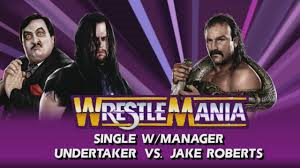 The Undertaker is still being built as the powerhouse, but Roberts was able to outsmart The Undertaker on a classic Funeral Parlor segment and he gained the upper hand on The Deadman heading into Mania. The match was ultimately the Inverted DDT of Roberts against The Tombstone Piledriver of The Undertaker. The latter would prevail in a much more solid match with a decent story to add to The Streak. The build to The Streak match at Wrestlemania VIII began in the buildup of heel Jake Roberts. He was becoming a super heel in the eyes of fans and it was great to watch. He had plagued the Macho Man and Elizabeth with a Cobra at their wedding reception. He had tied Macho Man in the ropes and let the King Cobra dig it’s fangs gruesomely into his arm. In the background was Jake Roberts laughing maniacally as his snakes did their damage. Later on, Roberts was waiting with chair in hand behind the curtain waiting for the tormented couple after a match. When he went to swing, The Undertaker would block it and this lead to Jake Roberts appearance on the Funeral Parlor of Paul Bearer. He asked the question of who’s side was The Undertaker on? The Undertaker took The Urn from Bearer, spoke into the microphone and said, “Not yours.” However, Roberts would trap Taker’s hand in the casket, DDT Paul Bearer, kick The Urn and viciously take The Undertaker down with multiple chair shots. Roberts had made his point that he can hurt The Deadman. Jake Roberts was vicious enough to be a believable threat to The Undertaker. The problem is despite the onslaught of his attack on the Funeral Parlor, The Undertaker would rise up, dragging the casket behind him in relentless pursuit of Roberts. The two men were out for blood and who was willing to go further The Snake, or The Deadman? The match was a back and forth battle as both men were able to get some offense in the ring and on the outside. The climax of the match would occur as battle of the Invented DDT against The Tombstone would come to a head. Roberts would hit a DDT only to see The Undertaker sit up. Roberts would hit a second one that would put The Undertaker down for a stretch of time. Roberts may have even got the win there to stop The Streak dead in its tracks, but the vicious side of Roberts would be his downfall. Rather than go for the cover, he would move on to The Urn and Paul Bearer. This would give The Undertaker another sit up moment before hitting the Piledriver onto The Snake on the mat outside sending Roberts to Tombstone City. The Undertaker pushed Roberts back into the ring for the 3 count and his second Wrestlemania win. If I’m being picky, I’d would have liked another Tombstone inside the ring for good measure before the three count. However, this match continues the trend of making The Undertaker look invincible at Wrestlemania while continuing to show how dominating the Tombstone Piledriver is. Robert’s Inverted DDT was a major move that changed in ring wrestling, yet two of those were not powerful enough to take down The Undertaker. However, one Tombstone was enough to put out Roberts on the outside. This put over the Tombstone even more and made Undertaker a positive threat in the WWF world. The payoff of watching the vicious Jake Roberts get put in his place by The Deadman was a good story, and the work in the ring was solid enough to be able to tell that story appropriately. I don’t know if I agree with using the Macho Man as the victim and The Undertaker the hero, but here we are all these years later and the wrestling world spins just fine. What is really interesting to me about this match is Roberts was the selling point of the feud. That is a trend that is going to become crucial to The Streak later on since every year someone tries to conquer The Streak. In that way, Jake Roberts through some luck and a solid heel run was simply ahead of history. I’d argue Roberts was the first one to really try to conquer The Streak, and it seems appropriate that exactly twenty years later, as The Undertaker goes for victory 22, The Snake enters the Hall of Fame. Good timing for all involved and a fun note of The Streak’s history. The match was solid and the match was ahead of its time. No one was self aware of The Streak yet, and the point of the match was to continue the dominance of The Undertaker character in WWF storytelling and as a performer at Wrestlemania. This is the first good match of The Streak and I will remember it as the trend setter that would become The Streak. I’d like to end with a congratulations to Jake “The Snake” Roberts for entering the Hall of Fame this year. His work here really just reminded me how much he deserves his place in wrestling history. Next time, we pick it back up a year later at Wrestlemania XI as The Undertaker is challenged by a giant.